"William Link's television work has won four Edgars and two Emmys. Among other series, his executive producer credits include "Ellery Queen," "Murder, She Wrote," and "The Cosby Mysteries." But he'll always be remembered best as one of the creators of the immortal Columbo, thereby changing the face of TV detection forever. We're thrilled to welcome him to The Mystery Bookstore to sign this anthology of 12 never–before–seen short stories featuring the man in the tan raincoat." Mystery Bookstore selected THE COLUMBO COLLECTION for their July Delicate But Deadly Club Selection. "Link has a natural ear for dialogue, in particular giving voice to the character of Columbo, fleshing him out as a detective hero who is genuinely gracious, awkwardly modest, and completely unforgettable. ... Not only is Link a clever plotter, but he demonstrates his sensitivity in stories like "Grief," in which Columbo learns the misguided reason why someone would run down an elderly retired physician. ... Highly recommended!" JUST ONE MORE THING Lieutenant Columbo -- short, unkempt, shapeless raincoat flapping open, unlit cigar in his hand-- turns towards the murderer who is certain that this undistinguished plainclothesman will never see through his perfect crime. Then -- just one more thing and the murderer realizes that his murder plot has unraveled. Columbo, played by the marvelous Peter Falk, appeared as a made-for-television movie in 1968, then the long-running series in 1971 and kept coming back over the decades. One of the finest detective series ever to appear on television, Columbo was created by William Link and his late collaborator Richard Levinson. With The Columbo Collection, Link has written 12 brilliant new stories in which murderers try to get away with murder but come up against the rumpled but unflappable Lieutenant Columbo. If you enjoyed the Columbo TV series, or even if you didn't, you might enjoy this Crippen & Landru collection of original stories by William Link, one of its creators. You probably know that Crippen & Landru publishes great reprints, but this collection isn't a reprint. As I said above, it's all original. These stories weren't done as part of the TV series, and they've never appeared in print before. And take a look at the cover. It's by Al Hirschfield, and I'm sure you can find his daughter's name hidden in it. But can you find the hidden gallows and noose? I'm looking for it, myself. This just arrived at Casa de Crider, but I'm looking forward to reading some of these inverted detective stories and seeing how Columbo figures things out. Los Angeles Police Detective Lieutenant Columbo, arguably the greatest fictional detective originally created for television, appears in a dozen sharply plotted and written new stories, all in the inverted tradition, by surviving co-creator William Link whose first story with long-time collaborator Richard Levinson appeared in the November 1954 issue of Ellery Queen Mystery Magazine. 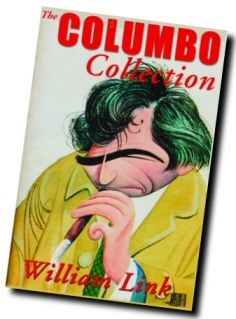 Lest you think all is gloom these days, I recommend you pick up The Columbo Collection by William Link. Link was one of the creators of the Columbo TV series, but this isn't a collection of stories based on the shows. It’s all new and all original. none of the stories has appeared in print before, but they're all just as much fun as the TV show was. If you have fond memories of the series, you'll get a lot of pleasure from this book. When it comes to the being the master of deductive reasoning no one comes even close to Lieutenant Columbo. Not Hercule Poirot's little grey cells. Not Sherlock Holmes, Nero Wolfe, or Lord Peter Wimsey. What separates Columbo from these classic greats is his everyman nature, his unassuming personality, his crooked smile, and his constant state of confusion when working a case. He might look like a bumbling fool to most of the killers he interviews. The guilty believe that they have put one over on Columbo by getting away with a perfect murder. However after he leaves, he happens to return a few minutes later to ask "Just one more thing," and then they are finished. They have been outsmarted, outwitted, and outplayed (just like a game of SURVIVOR) by this lowly detective who managed to find the one thing that will convict them for life. Whether it be a used cigarette, a wrinkled dress suit, or a package delivery. When he gets you, he gets you. American actor Peter Falk has charmed audiences for over twenty years in his portrayal of this police lieutenant. Sure there have been some imitators, but Columbo is the true original. Sadly, it is highly unlikely that viewers will get a chance to see a new Columbo movie but THE COLUMBO COLLECTION is the next best thing. William Link, one of the co-creators of this beloved character, has written a collection of brand-new stories featuring this detective and it is as though he has never left. The stories are relatively short, not likely to have been produced for television, but they show Columbo at his best, always being one step ahead of the guilty party. Reading this collection brought the pleasures of the original series all back, and they were very welcome. Thank you, Mr Link, for bringing back a beloved institution. This collection is a can't miss. If you have yet to meet Columbo, here's your chance. Some great blog reviews from Les Blatt!